Good pickup which is also wax potted so no feedback, it sounded great even with distortion. The bigsby had a mind of its own even a touch would send it out of tune, but that could be as much about the set up as the trem. That's a shame... but I did guess it would be more suitable for feedbacky alt-rock type electric stuff than as an acoustic. It still looks cool, but I probably wouldn't want to own one. If they could have found away to attach the extras without effecting the build and tone it would be a heck of alot better! 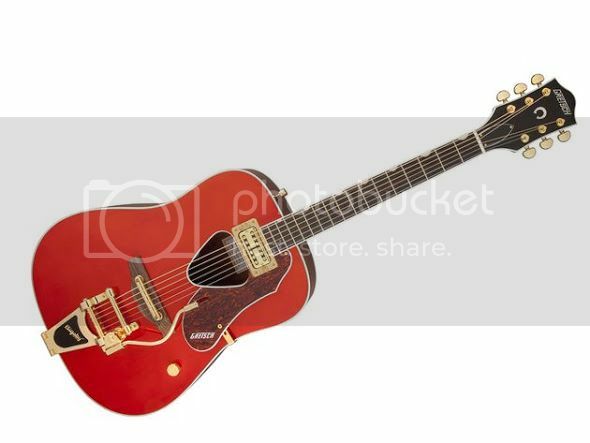 The heavy build might actually be deliberate, to reduce feedback - old Gibson J160Es are like that... the top is about a quarter of an inch thick, made from a double laminate. It's probably not aimed at actual acoustic players.